Avoid the slow servers and Anonine is a good value torrent-friendly VPN. The novice-friendly Windows client is a plus, too. While many VPNs sell themselves on their site unblocking abilities, Swedish-based Anonine is much more interested in anonymity and speed. And it makes some big supporting claims, too, including: "always anonymous, nothing logged", and "most available bandwidth of all VPN providers." Lots of bandwidth doesn't necessarily mean lots of locations, and Anonine offers 22, covering Europe, North America, Argentina, Australia, Iceland, Panama, Russia, Singapore and Turkey. The service doesn't have any unusual bonus features, but it delivers on the fundamentals: torrent and P2P-friendly, 5 simultaneous connections, no limits on bandwidth or speed. There's OpenVPN, PPTP, SSTP and L2TP (over IPsec) support, and Windows, iOS and Android clients simplify setup. There are web tutorials available to help you configure a Mac or set up your device manually. 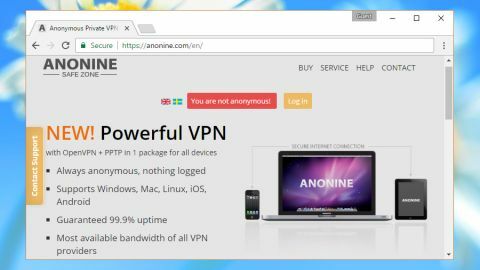 Anonine's biggest appeal to new customers could be its price, at €6.99 (£6.05, $7.55, AU$9.80) for a single month, and only €3.99 per month (£3.45, $4.30, AU$5.60) if you opt for a full year. There's no trial or free plan, but the company says you're "100% backed by our 7-day money-back guarantee." The provider stores only your email address and some level of payment data (probably an ID such as your PayPal account, although that isn't clear). That's fractionally more than some companies, although it's good to see the firm isn’t collecting phone numbers, physical addresses and other personal details. It's a similar story with the Anonine website. The company uses Google Analytics and cookies, a little more tracking than the best companies, but the bulk of VPNs do something similar and it has no effect on the privacy of the service. Elsewhere, the refund policy is disappointing. Despite that headline claim of a 7-day money-back guarantee, you'll only get a refund if "the user had reasonable expectations on the service which Anonine.com was not able to fulfil." This is entirely at the discretion of Anonine, "taking into consideration all reasons of such user’s wish", and may only be a partial refund if (presumably) you can't quite convince them. Anonine's signup process was straightforward, with payment methods including credit cards, PayPal, Bitcoin, phone and more. Unusually, we were able to sign up for a 1-month PayPal account without creating a subscription (no automatic renewals for us). A web console gave us links to the iOS and Android clients, but we skipped them in favour of the Windows package, which installed quickly and without issue. The Windows client has a straightforward, easy-to-use interface. In a click or two you're able to select a country and protocol, and get connected. A separate Favourites list gives speedy access to your most commonly-used locations, and there's a Connection Log tab available to help with troubleshooting. Experts won't be impressed by the Settings dialog, which contains nothing even faintly advanced, but overall the client handles the basics very well. Our performance tests* started well, with Western Europe and some key connections (UK-New York) managing 35Mbps download speeds at a minimum. In other words, you might not see much difference from your regular rates without a VPN. Long distance traffic is a different story, unfortunately. UK-Los Angeles downloads were 12-14Mbps, Singapore around 10Mbps, Australia was struggling to reach 2Mbps (we've seen 5-10 times faster rates than this elsewhere). There seem to be no issues with privacy, at least, whatever server you're using. Anonine always allocated us IP addresses in the locations we expected, and automatically blocked any WebRTC or DNS leak. Anonine's sluggish long-distance connections are a concern, but if you want a speedy Western European IP for torrents then the company could be an easy-to-use, low-cost solution. Just beware of the conditional refund policy.